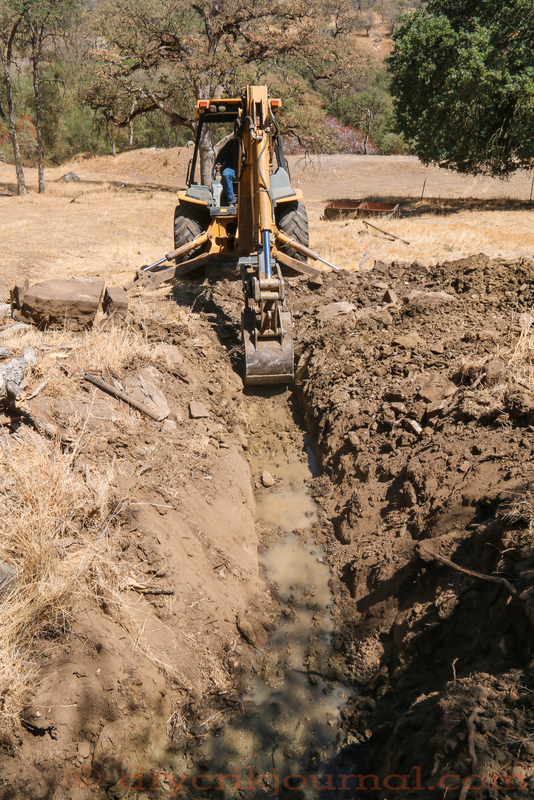 We’ve been on David Langton’s list for well over a month as he moves ranch to ranch with his four-wheel drive backhoe improving stock water. Railroad Spring has been nearly dry for two years, with not enough water in the spring box to reach the pipe. Hand dug and constructed of concrete and rock with a disc blade lid, it’s provided good water since well-before my time with the exception of the droughts of 1938-39 (anecdotal) and 1976-77. (Heavy equipment working at the 2,400-foot elevation 4-5 miles from the asphalt is always a clash of sensibilities for me.) In the photo, David has dug about three feet below the original spring box and gotten to a flowing crack in the hard rock, nearly an impossible task to reach with a pick and shovel. He’s trenching the pipeline we will install this morning to the troughs in the background, which will presumably overflow in a normal year to the dirt tank beyond them. When the trench was completed, we measured the flow at 1½ gallons/minute, that if sustainable would amount to well over 4,000 gallons/day, however, as so often is the case, the flow subsided to about ¾ gallons/minute after about five hours. We intend to work around the original spring box some more before installing our new spring box and pipe. Meanwhile, we broke a little water loose at the Grapevine spring a 1/4 mile away, and mucked out enough silt to form a basin where the cows can water, previously preferring to drink the fresher water pooled in their hoof prints than the warm stale remnants at Railroad Pond. Open to two other pastures with water, my count at Railroad was 24 head of cows getting ready to calve. This entry was posted in Photographs, Ranch Journal and tagged David Langton, Dirt Works, Railroad, Railroad Pond, Railroad Spring, spring box. Bookmark the permalink.